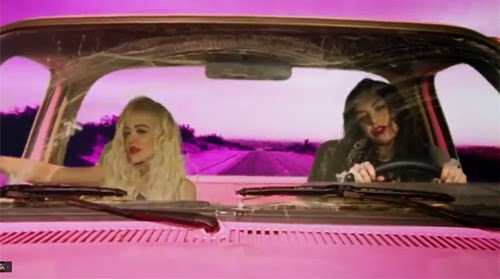 "I wanted it to be like this badass Barbie Thelma & Louise-esque video," Charli XCX told Buzzfeed of her new Rita Ora-featuring video, Doing It. "So we robbed a store with toy guns, rode a bucking bronco, and nearly crashed a pink pickup truck through the desert." Sounds amazing, right? But Charli would have been more accurate if she'd said: "I wanted it to be like Lady Gaga's video for Telephone if it had been shot for £10 and half a Twix (the biscuit half)." That's not entirely a criticism, though. Charli XCX's videos often make her seem brattish, but here she comes across as a teenager goofing off with her best friend on Vine. Hopefully, this single, which has just been added to Radio 1's C list, will chart higher than Charli's last single, the snotty-nosed Break The Rules, which stalled at number 35. Ms XCX is also preparing to tour with Katy Perry, and belatedly releases her new album, Sucker, in the UK next month. So that's nice.